Solution: To create an inclusive play environment, a PlayBooster® playstructure with an extensive ramping system was installed. The ramps allow kids using wheelchairs or other mobility devices to get to the highest levels on the playground, and there are playground activities like the Rollerslide and Sway Fun® glider along the way. Set apart from the main playstructures are even more opportunities for inclusive play. 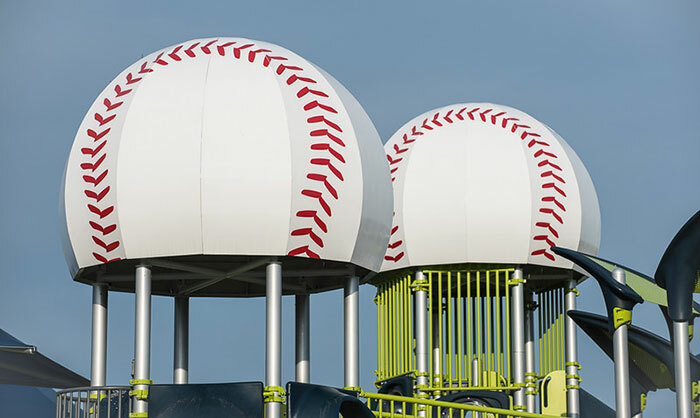 And to tie in with the nearby Miracle League baseball field, custom baseball roofs were included. Visit playlsi.com to read more about how the City of Ankeny Parks and Recreation department partnered with community organizations to bring a unique recreation experience to the kid of Ankeny as well as surrounding communities. Introduced exciting new products—Pulse™, We-saw™ and three site furnishings collections—in January. Steve King, cofounder of Landscape Structures, unveiled his book A Legacy of Play, which documents the more than 40-year history of the company. Announced our new partnership with Kiwanis International, and kicked off a contest to help bring play to communities around the world. Our winner was the Iola Kiwanis club in Iola, Kan., which is currently fundraising for their inclusive playground. Barb King (1946-2008), cofounder of Landscape Structures, was inducted into the Minnesota Women Business Owners Hall of Fame, which honors women entrepreneurial leaders who represent 150 years of Minnesota business history. Introduced new signature designs including the Eclipse Net® Plus, Hillscape Adventure and GeoNetrix. Hosted occupational therapists for a playground tour throughout the Twin Cities metro during the AOTA Specialty Conference. Collaborated with Washington D.C. Parks and Recreation to renovate playgrounds throughout the city. Completed our 18th inclusive playground project with The Miracle League. Installed a SpongeBob-themed playground at Enterprise Elementary School in Enterprise, Fla., which was the grand prize of the 2012 Nickelodeon “I Wanna Play” Sweeps. Reconnected with, and met new, parks and recreation professionals at our party at Lucky Strike Lanes during the NRPA Congress & Exposition in Houston. Attended the ASLA Annual Meeting & Expo in Boston at which our booth, featuring GeoNetrix, was voted by landscape architects as Best Visual Appeal. Celebrated with our partner, Shane’s Inspiration, the grand opening of the first inclusive playground in the country of Ecuador. In less than two weeks, we’ll continuing celebrating a great 2013 with our playground consultants from around the world when they arrive in Minnesota for our Annual Sales Meeting. Stay tuned for announcements of our new catalog, products and more in the upcoming weeks! Want to be the first to hear about them? Sign up for our e-newsletters or subscribe to receive notifications of new blog posts by email. Last month, the Miracle League of North Alabama, located in Huntsville, celebrated the grand opening of its baseball complex at Braham Spring Park. The accessible baseball field is now ready for the 165 kids and adults with special needs who are signed up to play baseball this fall, plus the complex includes a truly inclusive playground and a one-of-a-kind concrete statue of Homer, the Miracle League’s mascot. 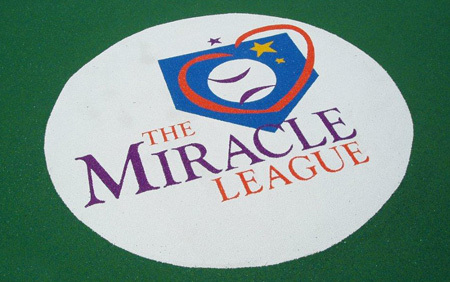 Miracle League logo in PebbleFlex® surfacing. The grand opening event welcomed nearly 200 people from Huntsville and surrounding communities. People in attendance learned about the history of The Miracle League Association, the national organization that designs and constructs custom baseball fields for children with mental and/or physical challenges, from Executive Director Diane Alford. Additionally, the mayor of Huntsville, named and dedicated the field Johnny Franklin Field, after Johnny Franklin, North Alabama’s league director, the league developer for the national office and the driving force behind the project in Huntsville. Inclusive PlayBooster® Vibe™ play structure with PebbleFlex safety surfacing. We’re proud to say that we were involved in each main component of the baseball complex. The accessible baseball field was created using PebbleFlex® safety surfacing, which features custom color blends and graphics including the Miracle League logo. 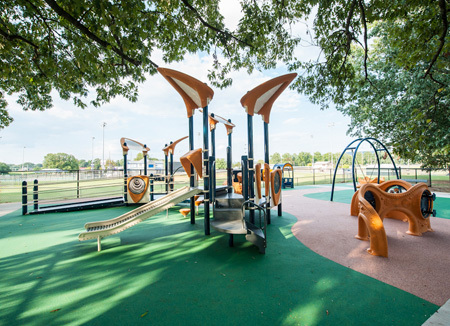 The inclusive playground features a PlayBooster® Vibe™ playstructure, and uses a variety of multi-sensory playground components like the Rollerslide, Cozy Dome®, OmniSpin® spinner and Oodle Swing®. 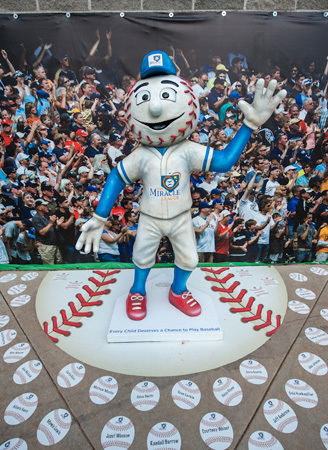 The Miracle League mascot, Homer, constructed of concrete. Unique to the Miracle League of North Alabama’s complex is the concrete statue of Homer. The statue, constructed of Glass Fiber Reinforced Concrete (GFRC), is completely custom designed and was hand-painted by Landscape Structures’ artists. Homer is positioned behind home plate, and provides a distinctive photo opportunity for visitors to the baseball complex.